A few weeks ago A Geek Daddy received a message from Hasbro asking me to choose a side in the Star Wars saga ... would I select the Light Side or choose the path of the Dark Side? That was a tough choice but in the end I couldn't resist the lure of the Dark Side with its gleaming white stormtroopers, evil Sith warriors and cool bounty hunters. #ChooseDarkSide I did! Hasbro followed up my response by sending a mysterious package my way. Of course my kids and I couldn't wait to open it up! What could be inside? 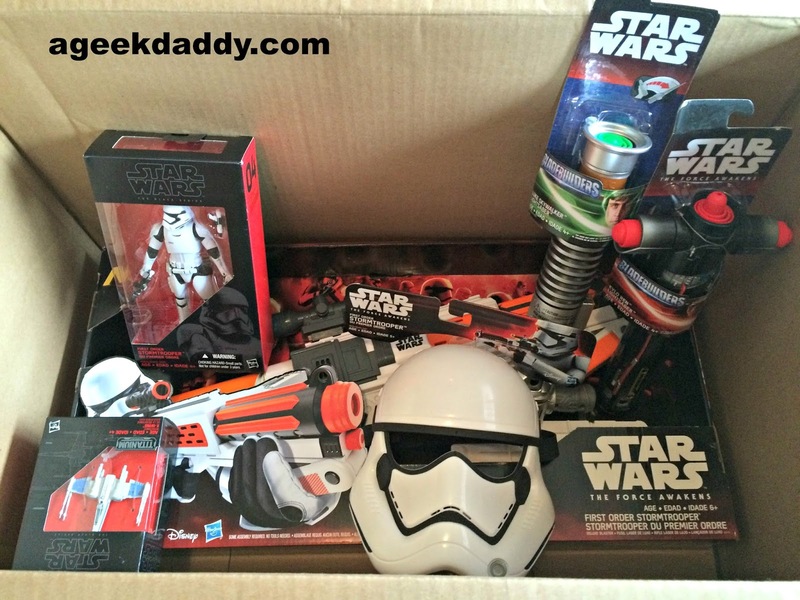 The box was filled with a preview of Hasbro's new toys based upon the upcoming Star Wars sequel THE FORCE AWAKENS. Based upon the path, I had chosen Hasbro provided a sample of toys that would help our family crush The Resistance in the name of The First Order! So let's take a look at the Dark Side of Hasbro's new lineup of Star Wars toys that were included in our #ChooseDarkSide mailing. These 6-inch scale figures are highly articulated and exceptionally detailed. Characters from STAR WARS: THE FORCE AWAKENS that will be available as these action figures include the First Order Stormtrooper, Finn (Jakku outfit), Rey with her droid BB-8 (Jakku outfit), Kylo Ren, Captain Phasma, Chewbacca, Poe Dameron, Constable Zuvio and First Order Snowtrooper among others. 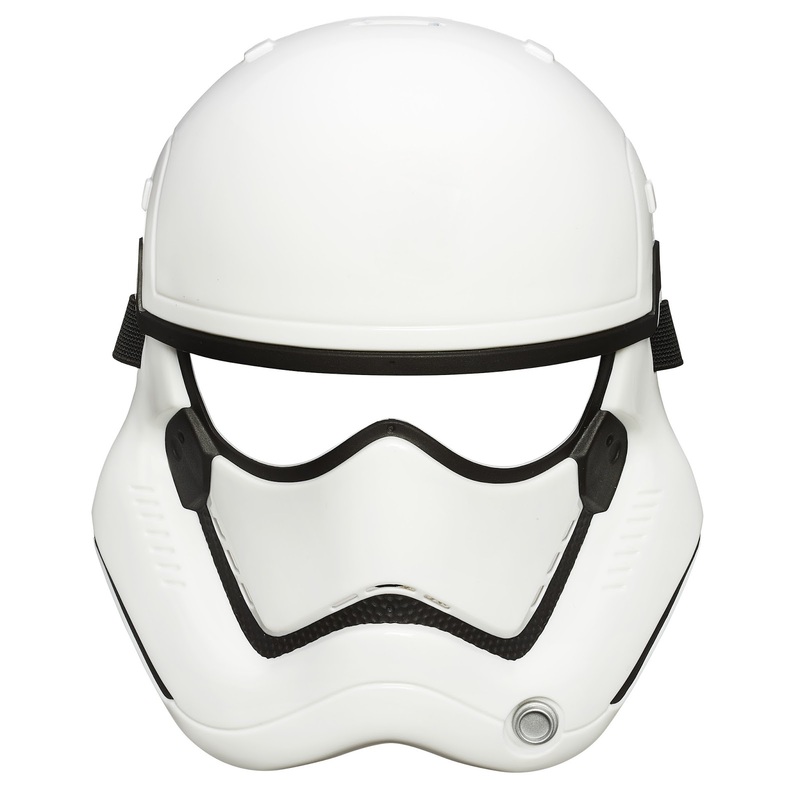 Join the battle for control of the Star Wars galaxy by donning a role-play mask. 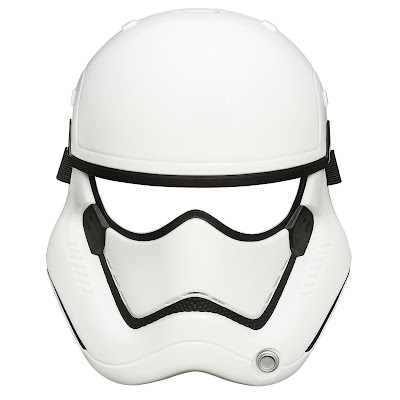 Kids can pretend to join The First Order by wearing a Stormtrooper role play mask. Wow! this NERF shooter was impressive, most impressive! 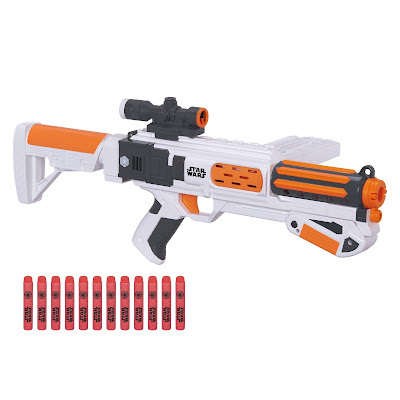 Pretend battling against The Resistance with this blaster that comes with a 12-dart clip, slam-fire action, removable sight, detachable stock and twelve NERF darts that fire up to 65 feet! The power of the dark side is strong with the Kylo Ren Extendable Lightsaber! With the flick of your wrist, you'll be ready to stop The Resistance in its tracks. 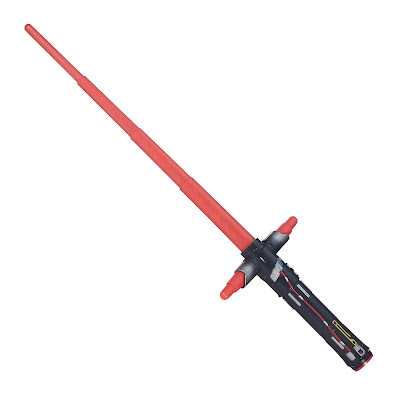 This lightsaber is compatible with other components of the Hasbro BLADEBUILDERS system [each sold separately] so kids can create incredible new lightsaber combinations. Every kid, and geek daddy, in town is going to want to relive their favorite scenes from the new STAR WARS: THE FORCE AWAKENS movie. 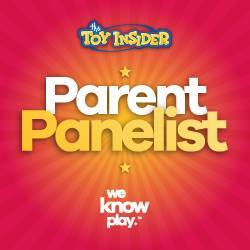 Whether you select the Light Side or Dark Side, Hasbro has a variety of toys for fans of all ages to spur on imaginative play and enhance fans' enjoyment of the film. 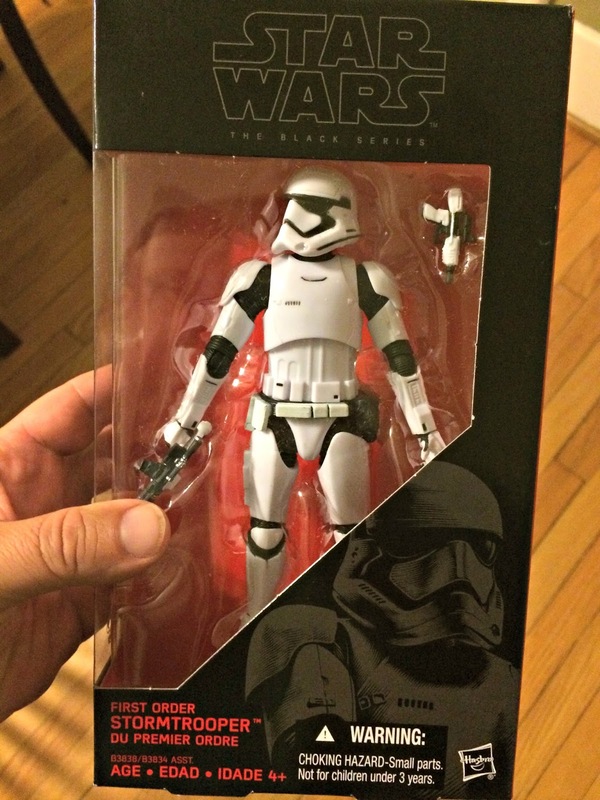 CLICK HERE for more information about Hasbro's entire lineup of STAR WARS: THE FORCE AWAKENS toys. So thanks to Hasbro our family is stocked up and prepared to be the scourge of the galaxy, well at least of our neighborhood, as we have some fun with the Dark Side of the Star Wars universe. May the Force be with you! Lightsabers! Those are my favorite :). My husband loves Star Wars. He is counting the days. 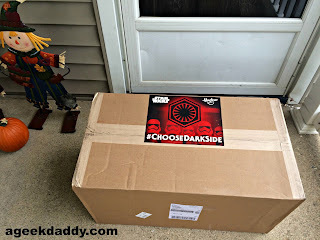 I loved seeing the #darkside toys as I received the #lightside toys myself. I really like the action figures myself! That NERF star wars is awesome. 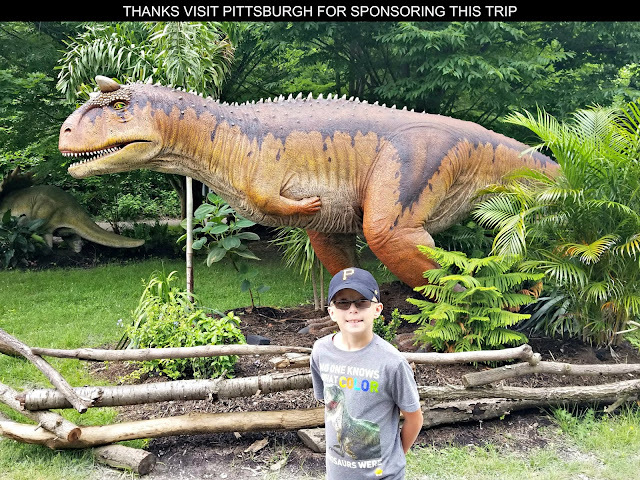 Would love to get that too for me and my kids!